An HBO documentary set to premiere Saturday, Aug. 24, will thrust Syracuse University into the national spotlight for all the right reasons, all due to a very talented man. Marty Glickman ’39 was many things to many people: the voice of their favorite sporting events and teams, including the New York Knicks, Giants and Jets, and a mentor to a generation of younger broadcasters, including Bob Costas ’74 and Marv Albert ’63. 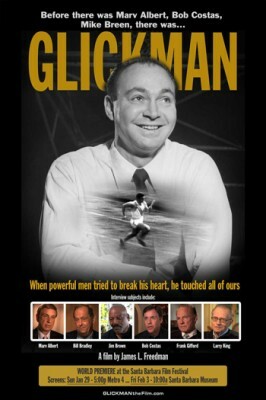 To Jim Freedman, Glickman was gold. Freedman took that confidence, along with nearly 70 years worth of archival footage, to craft a compelling biography of the many-layered persona Glickman offered his audience. As a young man from New York City, Glickman was quick, a lightning-fast runner who earned the nickname the Flatbush Flash. He came to Syracuse University in 1935, during which time he was part of the U.S. Olympic track team that competed in Berlin in front of Hitler, and featured Jesse Owens. For Glickman it was also a bitter experience, as he was bypassed to take part, in what many say was an act of anti-Semitism. The documentary features clear and crisp black and white film footage from Glickman on the SU campus and during football games at Archbold Stadium. Lisson praises Freedman’s drive and vision in bringing the project to fruition. “Jim moved heaven and earth to get Marty’s story to the screen. He even serves as the narrator, giving the documentary a true auteur look and feel,” Lisson says. The documentary is set to premier Aug. 24 in New York city as part of a gala being co-hosted by the S.I Newhouse School of Public Communications and HBO. It will make its HBO debut on Monday, Aug. 26. The event will also feature a roundtable discussion, “Memories of Marty,” featuring Costas, Albert and Freedman. All for the man who is as synonymous with sports broadcasting as the word “swish” is to basketball. It was a word Glickman invented to paint a mental portrait of the game to help his radio listeners better understand. They did. And loved him for it. Make no mistake, Glickman also loved Syracuse University. Freedman recalls one story from Glickman about visiting during a class reunion, and remembering the good times he had at SU, even in his spartan living space in a campus gym. Freedman says Glickman didn’t mind, because he could play sports all night long. In Freedman’s opinion this says much about the man and the legend who got his start on the SU Hill.